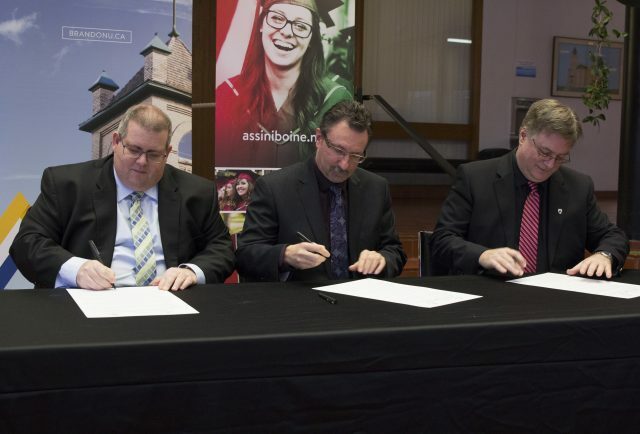 Assiniboine Community College President Mark Frison, Brandon Mayor Rick Chrest, Brandon University Interim President Steve Robinson sign copies of the new MOU. The City of Brandon, Brandon University, and Assiniboine Community College have formalized their existing spirit of collaboration and have charted a course for strong partnerships in research and innovation with the signing of a Memorandum of Understanding (MOU) between the three parties today at Brandon City Hall. 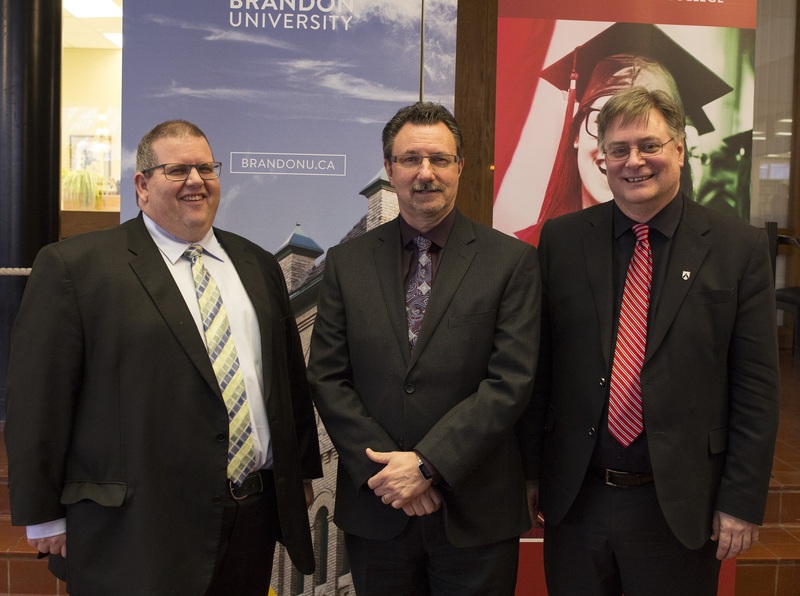 Brandon Mayor Rick Chrest was joined by Brandon University Interim President Steve Robinson and Assiniboine Community College President Mark Frison in signing the MOU, which places importance on collaborating on research and educational projects of mutual benefit. The three institutions have committed to regularly discuss challenges and opportunities within the City of Brandon, which may be addressed through applied research and educational projects. 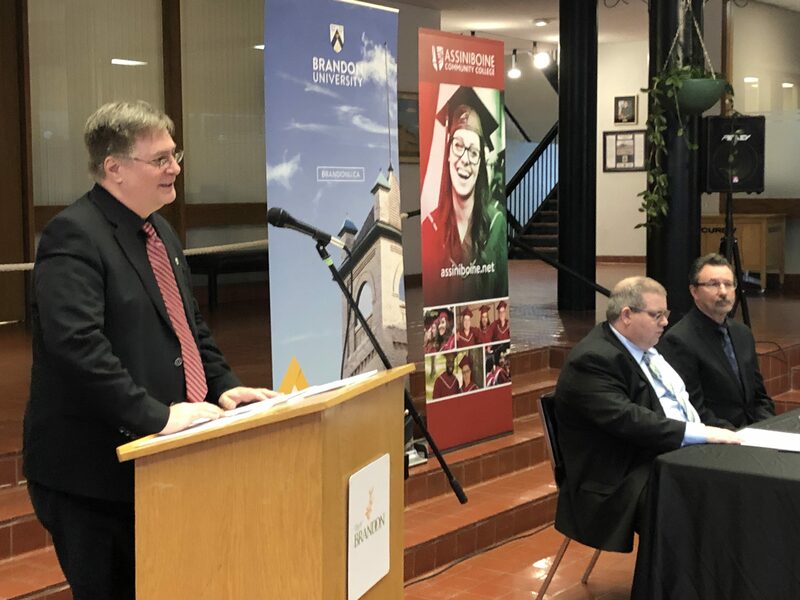 Brandon University interim president Steve Robinson speaks ahead of the MOU signing, giving examples of existing BU research that can address challenges faced by the City of Brandon. This new MOU builds on the existing MOU that Brandon University and Assiniboine Community College signed in 2014, which has deepened collaboration between the institutions and has led to new projects including a joint ‘Welcome Students’ campaign each fall and a new joint program in Public History, unveiled this month. Assiniboine Community College President Mark Frison, Brandon Mayor Rick Chrest, and Brandon University Interim President Steve Robinson. 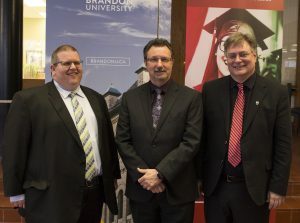 “We look forward to building on the existing relationships our college has developed with both Brandon University and the City of Brandon to provide applied research projects and activities for our students,” added Assiniboine Community College President Mark Frison. Under the new MOU, the three institutions will each name a representative who will collectively identify the most fruitful avenues for new research, drawing on the combined needs and strengths of the City of Brandon, of Brandon University, and of Assiniboine Community College.